Ae Mere Pyare Watan is an amazing patriotic song that is a part of the hit film, Kabuliwala. The song has an emotional side to it and the voice of Manna Dey further makes it reach the depth of our heart. Be it any republic day song list, this song is a part of all the lists. Similar to this song that has ruled our hearts for long, there are many others in the list as well that leave us replete with the feelings for nation. We are here with some such songs that you can add to your playlist so that all and sundry can enjoy the beat of the music without losing the essence of the celebrations. Here are the top 10 all time favorite patriotic songs for Republic Day. Rang De Basanti is the tile track that is sung by Daler Mehndi. This one is quite an energetic patriotic song and the favorite of youth. Aisa Des Hai Mera song from the movie Veer-Zaara. The lyrics of the song are actually the description of our beautiful nation that is enough to make anyone who hears the song fall in love with our nation. Satyamev Jayate is one of the most popular TV show that was hosted by Aamir Khan’s. The title track, Satyamev Jayate of the show is powerful enough to give goose bumps to nay one who hears the song. Many people even today have it as their ringtones. Des Rangeela song from the movie Fanaa is a beautiful patriotic song. It is a bit slower version in comparison to the other songs but the lyrics are very powerful. AR Rahman is the voice behind this beautiful patriotic song from the movie Swades. Unlike all the other songs in our list it is a slow motion song but very intense and meaningful. One of the songs from movie Dus is agin worth adding to your list. Suno Gaur Se Duniya Walo in the voice of Shankar Mahadevan is a patriotic song that fills one with the energy and also with the pride that we have for our nation. One of the most loved patriotic compositions of AR Rahman is the song Maa Tujhe Salaam, Vande Mataram. The lyrics in itself are enough to arouse the hidden feeling of the people towards the nation but the soulful voice in which it is sung further adds to the passion leaving you spellbound. Ae Mere Watan Ke Logon is a stunning song in the voice of Lata Mangeshkar. The song is basically a tribute to all those great freedom fighter and soldiers who sacrificed their lives for the independence and dignity of the nation. Your republic day song list is going to be a complete waste in the absence of this song. The lyrics of the song are such that these can literally tear you apart. This famours song full of patriotism is from the Bollywood flm, Naya Daur. The voice of Mohammad Rafi and Balbir leaves you with love flowing for the nation. This is a beautiful patriotic song from one of the most popular movie, Roja. The song triggers the sensitive and emotional side of an individual towards the nation. 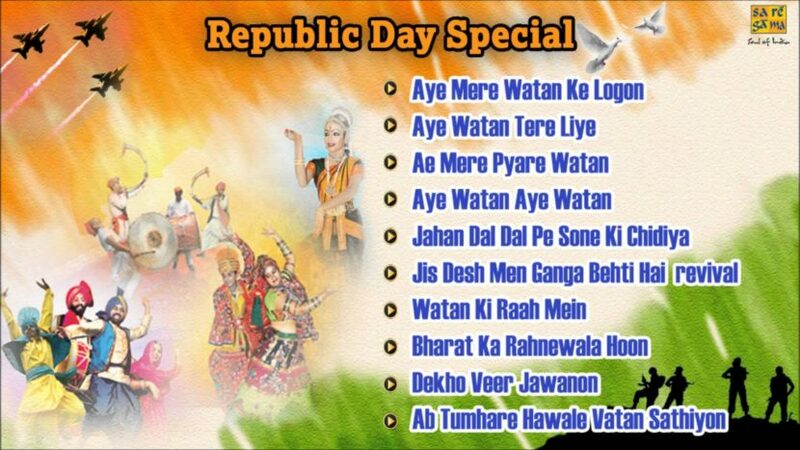 All in all, these are the top 10 all time favorite patriotic songs for Republic Day. These are simply a handful of Republic Day songs that are the best. However, there are many other songs as well that you may like. In case we have not added your favorite patriotic song to the list, do mention the same in the comment section below.